This is true and explain everything I felt in the past years. I always been the most quiet person when there’s many people around. I love their presence but I don’t feel like interacting with them (my original personality is this). So, that’s the ‘solitary together’ feeling. When we first started Nulis Buku Club in January 2010, we thought why there’s no writing club around? Maybe it’s because writers just want to write and be alone most of the time. I got a friend, I think she already published 100++ children books & novels. But never once, she can have the time to go out and meet me somewhere. She just want to write. I completely understand that writers find it easier to say something with words than speaking it. But to be able to share, especially with new writers, on how you’re doing what you’re doing, really would mean something for the community. The more people inspired to write, the more brilliant thoughts unleashed and spread to the world. With that passion to share in mind, me and friends of NulisBuku.com celebrate our birthday on 11.11.11 with books launching & talkshow. Normal, every day people, can be a writer and can have a chance to have a cool book launch event too! I know the feeling when you’re on stage and watched by 150 people for the first time. That’ll be one of the best moments of your life. One more powerful event last week called Wordisme. I speak to Mbak @AlberthieneEone day. I said I want to be a successful biography writer just like her. I want her to teach me. She said, instead she want to teach more people. Then she came up with idea of not only teaching biography writing, but also magazine, novel, blog & scriptwriting. We form a team, and make it happened yesterday, November 19, 2011. The line of speakers & moderators was amazing. All great writers. 350 people from all over Indonesia packed the room, and from the conversation on twitter @wordismeID #wordisme – I know they’re all super inspired! I want to thank all of NulisBuku team and Wordisme team to make all the great events happen. You know who you are. 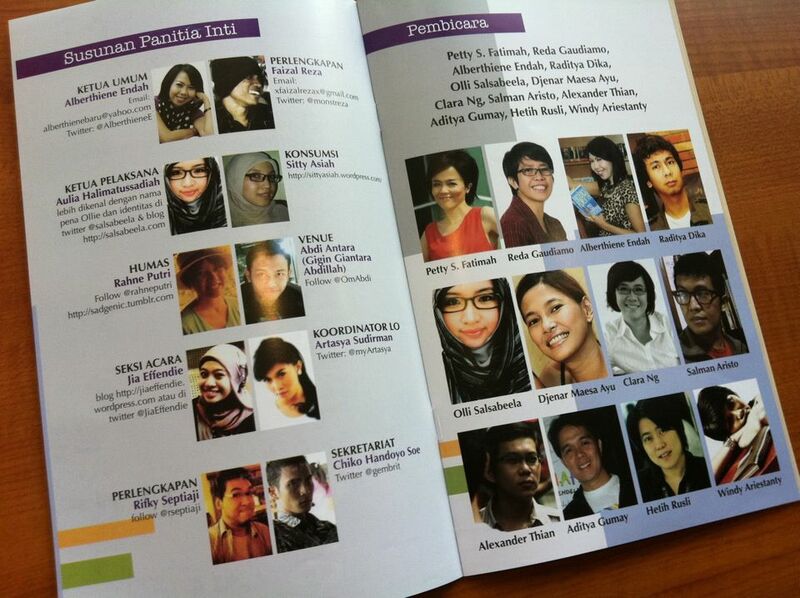 Also a huge huge thanks for mbak AE for the opportunities. Coming up next, there’s a NulisBuku.com event too at FIMELA Fest, November 26, 1pm – 3pm at Mini Stage, Level One, Grand Indonesia. You can register here. Excellent web site. A lot of useful iimorfatnon here. I’m sending it to some friends ans also sharing in delicious. And of course, thanks for your effort!